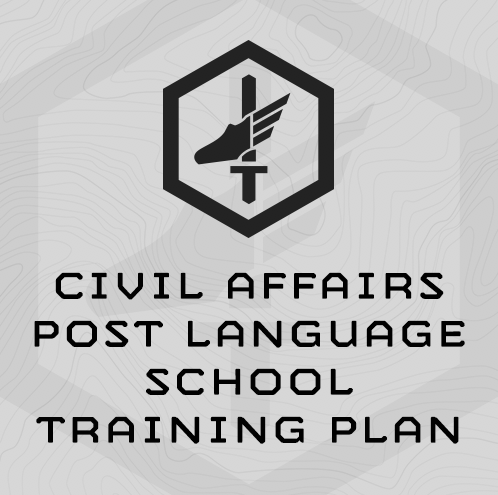 6-Week, 5 day/week sport-specifically designed to prepare athletes for the final fitness “gates” of the Civil Affairs Q-Course post Language School – specifically the APFT, 5-Mile Run and 12-Mile Ruck. This program gets progressively harder each week, until week 6, when the training tapers down into the start of the course. Don’t skip ahead! The plan is designed to build upon itself. If you have to miss a training day, start up back where you left off. This training program trains for the physical training standards a soldier is expected to pass at the Civil Affairs following Language School, including the 12-mile ruck, 5-mile run, and APFT. The plan also includes strength and work capacity training for all around fitness and durability. Stop Watch with Repeating Countdown Timer – Timex Ironman is best. Highly Recommended – GPS-enabled Stop Watch with repeating countdown timer (Garmin Forerunner 10 is recommended ) A GPS enabled watch will make measuring run and ruck distances much easier. What if I have less then 6 weeks before I start the Selection Course? Building stamina and resilience is a key training goal of this plan, and physical and mental stamina is also key to completing the course. If you can’t handle the training volume at first, its better to cut training sessions short, rather than take unscheduled rest days. What if I can’t make the prescribed reps for the bodyweight exercises, or the prescribed interval times for the rucks or runs? Can I see a sample of the training? Go to http://mtntactical.com/category/exercises/ to see unfamiliar exercises.